Silver Charm is one of the most popular Derby winners with horse racing fans. He is somewhat of a rags to riches individual, as he was essentially shunned as a yearling when offered for sale. His breeding was not what one would call “fashionable” at the time. His sire Silver Buck was a very good stakes winning son of Buckpasser, one of the greatest horses of the twentieth century. However, this line had fallen on hard times with breeders as the Buckpasser male line was perceived as a line that developed late maturing types, not suitable for the new breed of deep pocketed owners that were looking for quick returns on their investments. This impatience and short sightedness would be a big reason for the $16,500 price paid for the grey yearling colt by Silver Buck. He had his admirers even then though, as he was “pinhooked” and entered into the Ocala two year olds in training sales. According to Steve Haskin, in his book Tales From The Triple Crown, bloodstock friends of Bob Baffert had liked the colt and sent him a video, offering to bid for him on Baffert’s behalf. Due to Baffert’s schedule, he did not get a chance to view the tape before the sale. When he did, he liked what he saw but thought that the colt would have been sold. There was a $100,000 reserve for the colt, now named Silver Charm, which was not attained. Baffert offered $80,000 and an agreement was reached. Baffert then sold Silver Charm to his clients Bob and Beverly Lewis. The other half of Silver Charm’s pedigree is not what one would call stellar either. His dam is Bonnie’s Poker, a daughter of Round Table’s son Poker. Poker was already known as the dam sire of Triple Crown winner Seattle Slew, so there was that recommendation to the pedigree. However the tail female line did not contain much black type with in the first four generations. So even though Silver Charm had Buckpasser in his second generation, Round Table and Hail To Reason in his third generation, and Nasrullah, Princequillo, Mahmoud and War Admiral in his fourth generation, Silver Charm was not a fashionably bred horse. He was a very good looking, well made horse and the keen eyes of Bob Baffert and his bloodstock friends would prove to be quite right in their assessment. Baffert took his time with Silver Charm, allowing him to come to hand slowly. He made his race début at Del Mar on August 10, 1996. He finished second in the six furling race. He came back two weeks later to break his maiden at five and one-half furlongs and then was entered in the Del Mar Futurity, to be run on September 11. Silver Charm won the seven furlong G2 race, impressing Baffert so much that he put him away for the rest of the season to prepare the colt for the upcoming classics the following spring. Silver Charm made his three year old début in the grade three seven furlong San Vicente Stakes at Santa Anita on February 8, 1997, winning. He defeated another grey named Free House in this race but, Free House would turn the tables on Silver Charm in the next two races, winning both the San Filipe Stakes and the Santa Anita Derby. Both races were grade one events. Silver Charm was second in each of the last two races and Baffert was convinced he had a legitimate Kentucky Derby candidate. The 1997 Kentucky Derby would turn out to be an exciting race with Silver Charm and Free House engaging in a terrific battle at the top of the home stretch after they relieved pace setter Pulpit of the lead. They were joined by Captain Bodgit, who came rushing up on the outside. Silver Charm and Captain Bodgit then pulled away from Free House in the final sixteenth, but Captain Bodgit could not catch Silver Charm. Silver Charm won the Derby by a head, showing his courage and determination, and in the process generated a large legion of fans. He captured the Preakness Stakes at Pimlico in another exciting race two weeks later, again beating Free House and Captain Bodgit. Silver Charm and Free House engaged in a thrilling stretch duel with Captain Bodgit joining late on the outside. A bob of the head would decide the winner as the three were only separated by less than a head margin at the finish line. Silver Charm was now the talk of the turf world as he had a legitimate shot at Triple Crown immortality. The Belmont stakes is justifiably called “the test of champions”. One and a half gruelling miles of speed and endurance over one complete lap of the hallowed oval nick named Big Sandy. Arch rival Free House was back as was Touch Gold, an unpredictable colt who had been left at the gate in the Preakness when he stumbled but still finished fourth, a length and a half behind Silver Charm. Captain Bodgit could not make the race due a tendon injury, which would retire him from racing. Silver Charm and Touch Gold broke very alertly from the gate along with Wild Rush. Into the first turn Silver Charm, with regular rider Gary Stevens, drifted out giving Touch Gold the rail and the lead. Along the back stretch, Wild Rush would take command, Silver Charm looming to his right and Free House on the flank of Silver Charm, Touch Gold dropped back to fourth along the rail. As the field were in the far turn and approached the top of the long Belmont stretch, Silver Charm and Free House moved in tandem to take control with Touch Gold coming off the rail to make his bid. The stretch run was just as thrilling as the two previous races with the game Silver Charm and tough Free House in an all out battle, only to have Touch Gold come back and pass them in the final fifty yards to claim victory. Silver Charm became the twelfth horse in history to lose a Triple Crown bid in the Belmont Stakes. He fought all the way and was not disgraced in his effort, but it was still disappointing for his connections and his huge fan club. Baffert gave Silver Charm an extended rest as his owners had decided to race him as a four year old. He started in the grade one Malibu Stakes on December 26, 1997, finishing second in his return to racing. He did however win the Eclipse Award as the champion three year old for 1997. He was never worse than second in any of his three year old races. Three weeks later, Silver Charm officially began his four year old season with a win in the grade two San Fernando Stakes followed by his victory in the grade one Strub Stakes, both races taking place at Santa Anita. Next up was the lucrative and prestigious group one Dubai World Cup, a one and a quarter mile race inaugurated by Sheikh Mohammed in his home country. The race has become a major fixture on the early year calendar for world class horses to aim for. The race was another exciting affair involving Silver Charm. Behrens cut a moderate pace on the lead with Silver Charm stalking him. In the turn for home Silver Charm made his bid, finally passing the stubborn Behrens at the eighth pole but Loup Sauvage then passed him. Swain and Luso came up on the outside making their bids for glory. Remarkably, Silver Charm found more reserve energy and fought back to reclaim the lead, eventually holding off the hard charging Swain by a nose. The never give up team of Silver Charm and Gary Stevens had won the richest race in the world in a most impressive manner. Silver Charm was then be rested until June 13, appearing in the grade two Stephen Foster Handicap at Churchill Downs. He finished second to Awesome Again. This race was followed six weeks later with his bewildering fifth place finish in the grade three San Diego Handicap at Del Mar. He bled slightly in the race, so Bob Baffert decided to give the horse more time off to recoup. Two months later, Silver Charm was back at it in the Kentucky Club Classic Handicap. He would face a familiar foe in Wild Rush and the two hooked up in a riveting stretch duel which resulted in a dead heat for the shared victory. They were seventeen lengths ahead of third place finisher Acceptable. On October 17, Silver Charm was back at Santa Anita for the Goodwood Stakes and a reunion with his old rival Free House. Silver Charm won by two and half lengths to set himself up for the Breeder’s Cup Classic, to be run at Churchill Downs. The field for this running of the Breeder’s Cup Classic has been called the greatest field to ever assemble for this prestigious event. There were ten entrants, eight of which were established G1 winners, including some familiar rivals to Silver Charm, such as Touch Gold, Awesome Again and Swain. Also in the field were grade one winners Skip Away, Victory Gallop, Coronado’s Quest, and Gentlemen. The race was highly anticipated and would unfold as one of the most exciting in Breeder’s Cup history. The two greys Silver Charm and Skip Away were the co-favourites. Silver Charm made a clean break from the gate and settled into a stalking position three lanes of the rail as Coronado’s Quest set the pace into the first turn and along the backstretch, hounded by the classy Arch in second. Stevens kept Silver Charm on the outside, away from any chance of getting boxed in. When the serious running through the far turn began Silver Charm began his move. He went past Arch at the top of the stretch and then Coronado’s Quest at the eighth pole. However there was a brigade of horses coming from behind, both inside and outside of Silver Charm making their bids for victory. Swain was bearing down on the outside with a strong run but then began to drift right losing valuable real estate. Silver Charm was also drifting to the right, opening a hole for Awesome Again to come through with a furious run to take the victory, A blanket finish at the wire would see five horses with in a length of each other. Awesome Again first, Silver Charm second by a head, Swain third by a nose, Victory Gallop another nose back in fourth and Coronado’s Quest a further half length behind in fifth. This was a race for the ages in which Silver Charm was again involved in an all out battle. Silver Charm made one more start in 1998, three weeks later at Churchill Downs in the grade two Clark Handicap. He won the one and one-eighth mile race beating Wild Rush, who finished third. There was not much rest time to be had as Baffert and the Lewises decided to bring Silver Charm back as a five year old, beginning with the San Pasqual Stakes at Santa Anita on January 10, 1999. This race as it turned out was o be his last victory. He later finished third in the Donn Handicap and the Santa Anita Handicap, old foe Free House was the winner of the latter race, followed by a sixth in the Dubai World Cup and a fourth in the Stephen Foster Handicap. 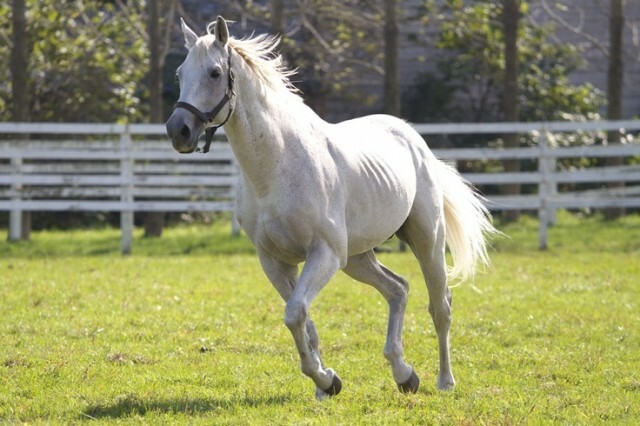 It was decided then to retire Silver Charm from racing and send him to Three Chimneys Farm in Kentucky to begin his stud career, the following year. Bob Lewis stated following his loss in the Stephen Foster; “Yesterday was his last race. At the conclusion, I looked at Bob Baffert and he looked at me, and we both agreed that retirement time had arrived”. Silver Charm retired sound and in great shape. He made twenty-four starts, winning twelve, with seven second place finishes and two thirds. He earned $6,944,369 in his stellar racing career. He would be elected to the Racing Hall of Fame in 2007. Silver Charm stood four seasons at Three Chimneys after which he was sold to Shizunai Stallion Station in Japan, where he resided for the next ten years. There was an agreement made at the time of his transfer to Japan that ensured to have Silver Charm returned to the U.S. at the end of his stud career from the land of the rising sun. This clause would be exorcised on October 29, 2014 when the announcement was made that the beloved Silver Charm was returning to Kentucky and be pensioned from stud duty. The twenty year old stallion arrived in the U.S. on December 1, 2014 at Old Friends Equine Retirement in Georgetown, Kentucky. Michael Blowen, the founder and president of this wonderful farm was absolutely thrilled to receive Silver Charm. “He looks fabulous” said Blowen upon the arrival of Silver Charm at the farm. The Lewis family issued this statement; “The Robert and Beverly Lewis family are thrilled and proud to have Silver Charm returning to America and begin his retirement at Old Friends Equine. We hope that Thoroughbred fans from around the world will enjoy visiting Old Friends and say “Hello” to one of America’s great race horses”. I for one will be making this pilgrimage very soon to do so. Silver Charm has been receiving many visitors since his arrival, and with warmer weather on the way, the amount of visitors he will get will only increase. Almost two decades removed from his wonderful racing career, and he still draws in the fans. Silver Charm is now charming his fans and devoted handlers at Old Friends, living the life of a king. He deserves no less. tough horse to retire sound after racing at that level a credit also to the trainer and owners to knew when to stop and to think of the horse.